All classes are held during the morning and are taught by professionals in each field and are held on site under the supervision of our own Gan Gani teaching staff. All classes follow a developmentally, child friendly philosophy and are positive and enriching experiences for your child. There are no additional charges for these classes. NEW! Kidokinetics inspires kids to get up, get moving, and get in shape as we set the tone for a lifetime of physical fitness Preschoolers will learn about the human body (anatomy, physiology, and nutrition), move and exercise, and have fun in a non-competitive, safe, and encouraging environment. 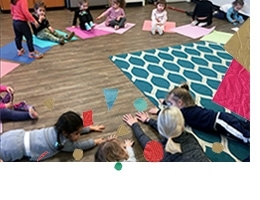 Yogeesyoga4kids offer children a safe and positive environment to begin their yoga practice with play and joy. Classes include games and interactive poses where they learn valuable motor skills and build self confidence and self-awareness, while improving flexibility, balance and coordination. Yoga also helps to increase focus and awareness, and improves overall health and wellness by building strong bodies and minds. Children gain an overall sense of well-being in an enjoyable and supportive environment. Children 2 years and older will have STEM classes weekly, led by our staff member, Jennifer Francy. With years of experience focusing on STEM in the classroom, Jennifer is well suited for this exciting position. 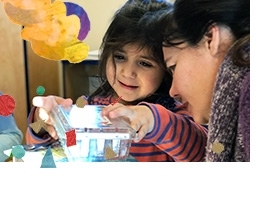 You can read more about the importance of STEM in Early Childhood Education here. 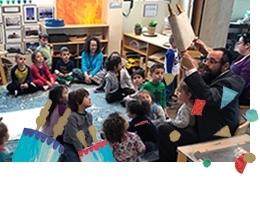 Rabbi Horowitz, the school rabbi, brings the stories of the torah to life as the children celebrate Shabbat complete with their own freshly baked challah. Gan Gani is happy to offer extra-curricular activities for your child. These classes are in addition to the enrichment classes taught in the morning during regular school hours. All classes are taught by professionals in each field and are held on site under the supervision of our own Gan Gani teaching staff. All classes follow a developmentally, child friendly philosophy and are positive and enriching experiences for your child. These classes change by semester. There are NO additional charges for these classes.